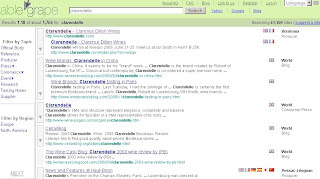 When it comes to finding information on wine on the Net, is it better to google or ablegrape? This morning I made a very simple test. I “googled” a few wine brands or names and then checked comparatively on ablegrape.com. Guess what? I had more pertinent answers through ablegrape.com. Let’s take one example. Clarendelle is a relatively new Bordeaux brand. The brand never really advertised but has a web site of its own in French and English. It is distributed mostly on international markets. Google found 3,960 answers for Clarendelle but about 95% were not pertinent or linked to pages saying “There is no answer about Clarendelle on that page”. Thank you for the information! Ablegrape.com was more helpful in that sense that I was able to figure out faster and more accurately if I would be able to find the information I was looking for on the page. It found 1,764 entries for Clarendelle, most of them quite pertinent. The page also gave the language and the type of site (wine store, blog, producer, trade). It was also possible to search by tasting notes, reference, producer, etc. What is ablegrape.com? Behind the search engine, there is a man, Doug Cook, passionate about wine and good programmer. Instead of talking about search engine optimization (SEO), he’d rather talk about “search friendliness”, a concept he brilliantly presented during the American Wine Bloggers Conference in July 2009. His work is a work of love and passion he keeps improving with the help of a strong community and a team of wine lovers like him. He’s committed to present the wine trade, wine writers and wine consumers with the best tool to research on wine. In the current situation where SEO strategies through Google are challenged by brands, a search friend specifically designed for wine is certainly one of the possible answers. I was rather impressed by all the improvement Doug brought to ablegrape.com since I first reviewed it in February 2008. If you’re a wine professional – whatever your area of expertise – or if you love buying and drinking wine, ablegrape.com is certainly the most adequate search tool offered at the moment. Enjoy! The idea that ablegrape is more attuned tofinding what you're looking for might alsobe because it is already one step into a search ahead of Google. Googles algorithms have to calculate the value of the search based on similar searches. The main problem here is that one already has to be aware of ablegrape , in order to make the comparison. What I'd really like to know is whether ablegrape is flexible to spelling errors or similies, when searching for 'something that sounds like 'Fallow'…'. Your advice on this matter would help a lot! The easiest way to answer your question would be for you to go on ablegrape.com and try on a brand you know. Just make a spelling mistake! As far as I know, ablegrape.com is still in the development phase and might not yet have all the specificities of an older system. But for wine consumers and professionals, ablegrape is a very good tool as it is designed to answer their needs.